Across Europe, Doctors Without Borders/Médecins Sans Frontières (MSF) teams are seeing first-hand the failure of current policies that are leading to the suffering, and even deaths, of people fleeing some of the worst humanitarian crises of our time. 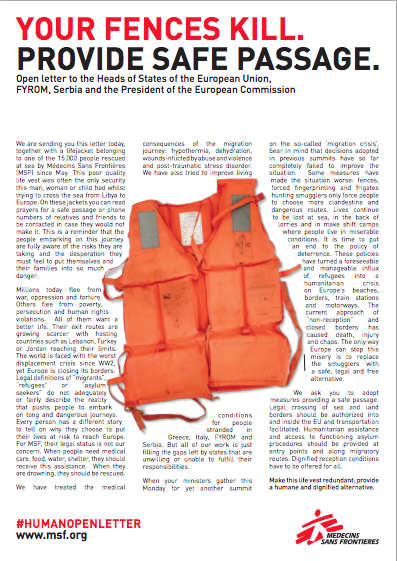 In an open letter being published in newspapers across Europe, and being delivered today to all EU delegations in Brussels ahead of a major ministerial meeting on the issue this week, MSF calls for a radical rethink of current approaches to asylum-seekers and an end to the strategy of "deterrence." Together with the letter MSF is sending discarded lifejackets bearing the handwritten prayers and next-of-kin details of people rescued by MSF at sea, which demonstrate how people are willing to knowingly risk their lives to reach Europe. This letter was sent to Switzerland, Norway, the Former Yugoslav Republic of Macedonia (FYROM), Serbia, and the President of the European Commission. We send you this letter today, together with a lifejacket belonging to one of the 15,000 people rescued at sea by Doctors Without Borders/Médecins Sans Frontières (MSF) since May. This poor quality life vest was the only security a man, woman, or child had while trying to cross the sea to Europe. These jackets sometimes feature handwritten prayers for a safe passage, or phone numbers of relatives and friends to be contacted in case the person wearing it does not make it. This is a reminder that the people embarking on these journeys are fully aware of the risks they are undertaking, and the sheer desperation motivating them to put themselves and their families in so much danger. We are treating the medical consequences of the journey, including hypothermia and dehydration, but also acute conditions requiring medical evacuation such as septic shock, pneumonia, and wounds inflicted by abuse and violence. We are trying to improve living conditions for people stranded in Greece, Italy, FYROM, and Serbia. But all of our work amounts to filling the gaps left by states unwilling or unable to fulfil their responsibilities. Many people are fleeing war, oppression, and torture. Others are fleeing poverty, persecution, and human rights violations. All want a safer and better life. But their exit routes are growing scarcer, while refugee hosting countries such as Lebanon, Turkey, and Jordan become more overburdened. The world is faced with the worst displacement crisis since World War II. The conflict in Syria shows no sign of abating. Yet Europe is closing its borders. Categorisations of "migrants," "refugees," or "asylum seekers" do not adequately or fairly describe the reality that pushes people to embark on long and dangerous journeys. Every person has a story to tell about why they were forced to risk their lives to reach Europe. When people need medical care, food, water, and shelter, they should receive this assistance regardless of their legal status. When your ministers gather this Monday for yet another summit on the so-called "migration crisis," bear in mind that the decisions adopted in previous summits have so far largely failed to improve the situation. Some measures have made the situation worse: fences and forced fingerprinting only push people to choose more clandestine and dangerous routes. Lives continue to be lost at sea, in the back of trucks, and in makeshift camps where people live in unacceptable conditions in the heart of the European Union. It is time to put an end to these policies of deterrence. They have turned a foreseeable and manageable influx of people fleeing for survival into a policy-made human tragedy on Europe’s beaches, borders, train platforms, and motorways. They are jeopardizing the right to seek asylum. The current approach of "non-reception" and closed borders is causing death, injury, and chaos. Europe is faced with an increasing number of people seeking assistance and protection. These people are only a small portion of the millions who are fleeing intolerable suffering. No matter the obstacles, they will continue to come. They have no other choice. The current policies are untenable in the face of this situation. The only way Europe can prevent a worsening crisis on its territory is to replace the smugglers by providing a safe, legal, and free alternative. We ask you to provide safe passage. Legal crossing of sea and land borders must be authorized for asylum seekers into and inside the EU. All forms of legal avenues allowing refugees to reach Europe must be put in place urgently. Efficient solutions to relocate asylum seekers from one EU member state to another must be found. Effective access to coherent asylum procedures and assistance should be provided at entry points, throughout Europe and along migratory routes. Swift registration and access to temporary protection should be provided upon arrival. Legal migration pathways must be created. Dignified reception conditions must be offered to all. Make this life vest redundant. Provide humane, dignified, and safe alternatives.